Any website that collects or transmits sensitive information must be protected by Secure Socket Layer encryption. SSL and its successor, Transport Security Layer (TLS), are security protocols used to create an encrypted link between a server and a client on the Internet, typically between a Web server and a Web browser. Failing to employ SSL/TLS can result in lawsuits and possible penalties should visitor data be compromised. Likewise, reputation damage can greatly impact future business. 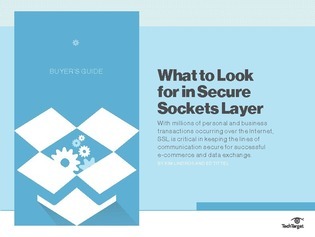 This Buyer’s Guide explains SSL and TLS technology in general and the types of SSL certificates available today. It also reviews features to consider and offers insights on how to determine the best SSL for a particular enterprise. Infosec pros and others who study this guide will come away with a more thorough understanding of SSL/TLS and be able to better identify what their company needs when in the market for SSL.